The Blackwater Imperial Stout Series is full of delicious dessert beers, with one exception: Oat, our Imperial Oatmeal Stout. Pouring black as night, with a mocha colored head, big dark flavors of molasses and bitter malts conspire to hide the high alcohol content. Brewed with 2-row pale malt, oats, caramel malt, barley flakes, chocolate malt, black malt, Columbus and Willamette hops, this beer is chock-full of what a real imperial stout should be brewed with. We’re brewing it expressly for the turning seasons. It’s a great beer to kick back with on a cool fall evening, or cellar some away for when the snow starts to fly. Opened up a bomber I've been saving for a couple of years. Appearance is still nice, with a rich, dark color and a good full head of dark tan foam. Smell is a little lacking, with only some oats and dark malt and alcohol aromas. The taste is much fuller and complex, though. Dark fruits, sweet malt, roasted chocolatey flavors and a fairly dry, slightly hoppy finish. Mouthfeel is rather thick, but the carbonation is robust enough to balance it. Overall, this is a very nice example of the style and quite drinkable. This is an impressive and unique imperial stout. From pour to taste, I knew this was different than other Imperial Stouts I've had. It has an oat-y wholesome taste that is both delicious and unique. Pour was thick...possibly as thick as any beer I've every had...with absolutely no head. "Motor oil" is a comparison raters make pretty freely, but it was very apt for this beer; this stuff would coat the back of a spoon. Aroma is of oatmeal, roastiness, and a surprising amount of hoppiness for a stout. Flavor is very unique - a ton of oatmeal flavor (which "oatmeal stouts" usually lack) and good cerealness, balanced with some chocolate malt roastiness and a bit of hop. Mouthfeel is thick, syrupy, viscous and good. This beer is excellent. Highly recommended. The aroma is very strong with coffee, oats, molasses, chocolate, and hops. The appearance is almost black with a large head. The taste is like the aroma with a burnt coffee oat finish. The palate is smooth. Overall this is an interesting beer but not that great. 22oz into a goblet. note this batch has a higher abv than stated, at 11%. A - Black as motor oil. Very opaque. Head formation is light, with only a few chocolate colored bubbles hanging around. Carbonation bubbles adhere to the glass strongly, but it doesn't have much for carbonation appearance. S - Extremely chocolately. Very bittersweet. A light oat grainy note hangs around in the background. Phenolics are barely detected, well hidden. T - Starts off with a light, dry sweet note of sugars and some bittersweet chocolate. Some roasted barley comes through. Gets a little bit dry through the mid-stream. Finishes with a very potent chocolate note, now on the sweet side. The only strong bitter flavors of this beer come through in the aftertaste. M - Strong body - very sugary and clinging. Aftertaste sticks to the tongue like glue. No carbonation bite. D - Deceptively potent. Flavors are well integrated, smooth. Easy drinking. ABV would sneak up on you. A good single session beer, not to be taken lightly. Dark cola brownish-black color. Arrived with neither head nor even the courtesy of a thin retentive collar. Just a few sojourn foam wisps twirling in the snifter center. Bummer. Roasted malt and dark vinous fruit aroma with a vanilla bean lean. Scents aren't exactly erupting from the glass. Taste is a roast malt and red grape edges soaked in something sweet, cloying, and wholly unpleasant - like thin molasses or hazelnut extract. Mouthfeel goes beyond oaty smooth, and is almost oily. With 11% ABV I was expecting something bold and bursting with flavor to be smoothed out and refined by a year of cellaring. Maybe it doesn't age well? A - Very black with a minimal head and almost no lacing. S - Well roasted coffee with some chocolate and some molasses in the background. T - Chocolate and coffee upfront with malty sweetness in the finish. I drank it as close to the recommend 48 degrees and at that temp could hardly sense the high alcoholic strength. M - Surprisingly "normal" as I was expecting something a little "thicker". Low carbonation makes this easy to drink. O - This beer warrants serious respect as the 11% ABV could jump you if you're not careful. This is a very good stout and well worth a try for anyone who enjoys this style. A vigorous pour produces a three finger thick, richly browned, tan colored head in my 25cl tulip glass. The beer is an opaque, black color no matter what angle I look at it. Aromas of tempered black coffee, dark chocolate, and acidic espresso are strongly noticeable and dominant, though the chocolate note is the least noticeable. Behind this are aromatic notes of deeply toasted grain, blackened malt, and carbonized wood. The aroma is really dominated by overly roasted malt characteristics; sharp, acidic and harsh some feeble attempts at balance are made by weak chocolate notes and concentrated caramelized malt sugars. The aroma is not bad and would in fact appeal to those who like hugely roasted beers, but it is fairly uni-dimensional / one sided. The taste is thick and rich up front with an ample, deeply caramelized, dark, malt sugar profile. The light carbonation makes has this leaning towards a creamy mouthfeel, but the roast acidity prickly carbonation cause the beer to thin out unsatisfactorily in the finish. Up front, creamy dark chocolate notes lend a richness and texture that is really quite nice, unfortunately the finish ruins this with sharp, bitter, burnt grain-husk flavors and a lingering roasted astringency. The harsh finish doesn't quite banish the rich, textured malt character though it gives it harrowing blow. A bitter, roasted, almost tepid, overly drained espresso flavor with blackened vegetal characteristics in the finish really gets in the way. While the aroma is way too one-dimensional, the front part of each sip is quite enjoyable; the rich, textured grain character (of which the oatmeal plays a significant role) accents a delightful chocolate flavor and reasonable espresso flavor. The finish though is overly sharp and roasted; harsh, off-putting and acidic, at best this beer needs five years to mellow. At which point it might actually be quite sublime. If you only have one bottle, I would highly recommend holding on to it for quite some time. 22 oz bottle. Something about the label on this bottle is unappealing to me. I guess I don't want a oat eating horse on my beer. Appearance: Completely black. Totally opaque. Just really, really black. A medium, brown head forms with the pour and lasts a couple of minutes. It fades to a rim and leaves some spots of lacing when I sip from the snifter. Smell: Rich, sweet, dark roasted malts. One of those stouts that has more almost burnt roastiness and caramelly sweetness than big chocolatey or coffee notes. Not that it is without chocolate or coffee smells, just more of the other. Slightly earthy/ grassy hops smell. This is starting out great. Taste: This is a big flavorful stout, but is hurt in the flavor profile by being too bitter. It seems like the hoppy bitterness up front is well balanced by the sweet maltiness, but the burnt malt bitterness becomes too much on the finish. Again there are some chocolate and coffee notes, but they are bystanders. I like it, but with every sip I wish it was less bitter. Mouthfeel: Great. Not the fullest mouthfeel like you get in some RISs, but so smooth and silky. Very nice. Drinkability: This is a tasty, huge beer with a pretty well hidden 11%. 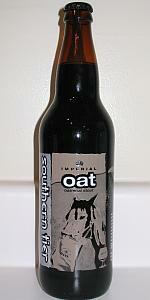 I whine about the bitterness, and I do think its a little bitter, but all in all, a really nice imperial oatmeal stout. Pours a nice deep dark brown color almost like a cola with a slight khaki colored head. The aroma is of alcohol, but also some chocolate, coffee, raisins, and yes a little oat, as well as a roasted malt. The taste is a roasted malt backbone, but there is also a good chocolate note, faint coffee, and a slight oatmeal taste at the end. The mouthfeel is of slight carbonation and is silky. The drinkability is good, your not going to pound them, but you can sit and sip a couple or more of these. Pours a pitch black with a thick layer of brown head that has great retention. There's a very light aroma; roasted malts, faint chocolate, and mild hop character. The taste is chocolaty and roasty with a very smooth, rich full body. There is also a smooth, citrusy hop bitterness. This is full boded and well carbonated. It's well balanced, delicious, and very drinkable. Pours almost no head. Thin ring of light borwn tiny bubbles. Pitch lquid. Smells caramel and roast. Grassy hoppy and alcohol edgy. Tastes thick sweet with strong hop grassya nd noticable alcohol burn. Carbonation is much stronger in the mouth than during the pour. Malt flavor is burnt and some coffee. Hopsa are grassy and blend with a vodka-like alcohol. Some hop blackberry flavor, so I'd guess Norther Brewer. Syrupy sweet aftertaste with some rubbing alcohol. Thick body. Not very drinkable.